Sun Tzu considered war as a necessary evil that must be avoided whenever possible. The war should be fought swiftly to avoid economic losses: "No long war ever profited any country: 100 victories in 100 battles is simply ridiculous. Anyone who excels in defeating his enemies triumphs before his enemy's threats become real". According to the book, one must avoid massacres and atrocities because this can provoke resistance and possibly allow an enemy to turn the war in his favor. For the victor, "the best policy is to capture the state intact; it should be destroyed only if no other options are available". Laying Plans/The Calculations explores the five fundamental factors (the Way, seasons, terrain, leadership and management) and seven elements that determine the outcomes of military engagements. By thinking, assessing and comparing these points, a commander can calculate his chances of victory. Habitual deviation from these calculations will ensure failure via improper action. The text stresses that war is a very grave matter for the state and must not be commenced without due consideration. Waging War/The Challenge explains how to understand the economy of warfare and how success requires winning decisive engagements quickly. This section advises that successful military campaigns require limiting the cost of competition and conflict. Attack by Stratagem/The Plan of Attack defines the source of strength as unity, not size, and discusses the five factors that are needed to succeed in any war. In order of importance, these critical factors are: Attack, Strategy, Alliances, Army and Cities. Energy/Directing explains the use of creativity and timing in building an army's momentum. Weak Points & Strong/Illusion and Reality explains how an army's opportunities come from the openings in the environment caused by the relative weakness of the enemy in a given area. Variation in Tactics/The Nine Variations focuses on the need for flexibility in an army's responses. It explains how to respond to shifting circumstances successfully. Terrain/Situational Positioning looks at the three general areas of resistance (distance, dangers and barriers) and the six types of ground positions that arise from them. Each of these six field positions offer certain advantages and disadvantages. The Attack by Fire/Fiery Attack explains the general use of weapons and the specific use of the environment as a weapon. This section examines the five targets for attack, the five types of environmental attack and the appropriate responses to such attacks. Traditionalist scholars attribute the writings of Sun Tzu to the historical Sun Wu, who is recorded in both the Records of the Grand Historian (Shiji) and the Spring and Autumn Annals as having been active in Wu around the end of the sixth century BC, beginning in 512 BC. The traditional interpretation concludes that the text should therefore date from this period, and should directly reflect the tactics and strategies used and created by Sun Wu. The traditionalist approach assumes that only very minor revisions may have occurred shortly after Sun Wu's death, in the early fifth century BC, as the body of his writings may have needed to be compiled in order to form the complete, modern text. The textual support for the traditionalist view is that several of the oldest of the Seven Military Classics share a focus on specific literary concepts (such as terrain classifications) which traditionalist scholars assume were created by Sun Tzu. 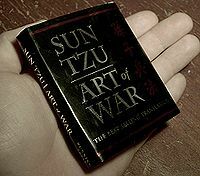 The Art of War also shares several entire phrases in common with the other Military Classics, implying that other texts borrowed from the Art of War, and/or that The Art of War borrowed from other texts. According to traditionalist scholars, the fact that The Art of War was the most widely reproduced and circulated military text of the Warring States period indicates that any textual borrowing between military texts must have been exclusively from The Art of War to other texts and not vice versa. The classical texts which most similarly reflect Sun Tzu's terms and phraseology are the Wei Liaozi and Sun Bin's Art of War. Skeptics to the traditionalist view within China have abounded since at least the time of the Song dynasty. Some, following Du Mu, accused The Art of War's first commentator, Cao Cao, of butchering the text. The criticisms of Cao Cao were based on a Book of Han bibliographical notation of a work composed of eighty-two sections that was attributed to Sun Tzu. The description of a work by Sun Tzu composed of eighty-two sections contrasts with the description of the Art of War from the Records of the Grand Historian (Shiji), in which the Art of War is described as having thirteen sections (the current number). Others doubted Sun Tzu's historical existence and claimed that the work must be a later forgery. Much of The Art of War's historical condemnation within China has been due to its realistic approach to warcraft: it advocates utilizing spies and deception. The advocacy of dishonest methods contradicted perceived Confucian values, making it a target of Confucian literati throughout later Chinese history. According to later Confucian scholars, Sun Tzu's historical existence was accordingly a late fabrication, unworthy of consideration except by the morally reprehensible. If the modern text of The Art of War reflects contrasting interpretations of the value in chivalry in warfare, the existence of these differing interpretations within the text supports the theory that the core of The Art of War was created by a figure (for example: the historical Sun Tzu) who existed at a time when chivalry was more highly valued (i.e., the Spring and Autumn period), and that the text was amended by his followers to reflect the realities of warfare in a subsequent, distinctly un-chivalric period (i.e., the Warring States period). On April 10, 1972, the Yinqueshan Han Tombs were accidentally unearthed by construction workers in Shandong. Scholars uncovered a nearly complete Western Han Dynasty (206 BC - 220 AD) copy of The Art of War, known as the Yinqueshan Han Slips, which is almost completely identical to modern editions, lends support that The Art of War had achieved its current form by at least the early Han dynasty, and findings of less-complete copies dated earlier support the view that it existed in roughly its current form by at least the time of the mid-late Warring States. Because the archaeological evidence proves that The Art of War existed in its present form by the early Han dynasty, the Han dynasty record of a work of eighty-two sections attributed to Sun Tzu is assumed by modern historians to be either a mistake, or a lost work combining the existing The Art of War with biographical and dialectical material. Some modern scholars suggest that The Art of War must have existed in thirteen sections before Sun Tzu met the King of Wu, since the king mentions the number thirteen in the Records of the Grand Historian (Shiji) description of their meeting. Some modern historians[which?] challenge the traditionalist interpretation of the text's history. Even if the possibility of later revisions is disregarded, the traditionalist interpretation that Sun Tzu created The Art of War himself (ex nihilo), and that all other military scholars must have copied and borrowed from him, disregards the likelihood of any previous formal or literary tradition of tactical studies, despite the historical existence of over 2,000 years of Chinese warfare and tactical development before 500 BC. Because it is unlikely that Sun Tzu created China's entire body of tactical studies, "basic concepts and common passages seem to argue in favor of a comprehensive military tradition and evolving expertise, rather than creation ex nihilo." Because the conditions and tactics advocated in The Art of War are historically anachronistic to the historical Sun Tzu's time, it is possible that The Art of War was created in the mid-to-late Warring States period. A view that mediates between the traditionalist interpretation that the historical Sun Tzu was the only creator of The Art of War in the Spring and Autumn Period and the opposite view, that The Art of War was created in the mid-late Warring States period centuries after Sun Tzu's death, suggests that the core of the text was created by Sun Tzu and underwent a period of revision before achieving roughly its current form within a century of Sun Tzu's death (in the last half of the fifth-century BC). The view that The Art of War achieved roughly its current form by the late fifth-century BC is supported by the recovery of the oldest existing fragments of The Art of War and by the analysis of the prose of The Art of War, which is similar to other texts dated more definitively to the late fifth-century BC (i.e. Mozi), but dissimilar either to earlier (i.e. The Analects) or later (i.e. Xunzi) literature from roughly the same period. This theory accounts both for the historical record attributing The Art of War to Sun Tzu and for the description of tactics anachronistic to Sun Tzu's time within The Art of War. Not all combat elements in The Art of War are anachronisms. One major missing element from The Art of War is the army's use of cavalry which was generally employed by 307 BC in China, during the Warring States period but a century after the Spring and Autumn period, thereby validating the traditionalist theory. Before the bamboo scroll version was discovered by archaeologists in April 1972, a commonly cited version of The Art of War was the Annotation of Sun Tzu's Strategies by Cao Cao, the founder of the Kingdom of Wei. In the preface, he wrote that previous annotations were not focused on the essential ideas. After the movable type printer was invented, The Art of War (with Cao Cao's annotations) was published in a military textbook along with six other strategy books, collectively known as the Seven Military Classics (武經七書 / 武经七书). As required reading in military textbooks since the Song Dynasty, more than 30 differently annotated versions of these books exist today. The Book of Sui documented seven books named after Sun Tzu. An annotation by Du Mu also includes Cao Cao's annotation. Li Jing's The Art of War is said to be a revision of Master Sun's strategies. Annotations by Cao Cao, Du Mu and Li Quan were translated into the Tangut language before year 1040. Other annotations cited in official history books include Shen You's (176-204) Sun Tzu's Military Strategy, Jia Xu's Copy of Sun Tzu's Military Strategy, and Cao Cao and Wang Ling's Sun Tzu's Military Strategy. The translator Samuel B. Griffith offers a chapter on "Sun Tzu and Mao Tse-Tung" where The Art of War is cited as influencing Mao's On Guerrilla Warfare, On the Protracted War and Strategic Problems of China's Revolutionary War, and includes Mao's quote: "We must not belittle the saying in the book of Sun Wu Tzu, the great military expert of ancient China, 'Know your enemy and know yourself and you can fight a thousand battles without disaster.'" The Art of War has also been applied in the world of sports. NFL coach Bill Belichick is known to have read the book and used its lessons to gain insights in preparing for games. Australian cricket as well as Brazilian association football coaches Luis Felipe Scolari and Carlos Alberto Parreira are known to have embraced the text. Scolari made the Brazilian World Cup squad of 2002 study the ancient work during their successful campaign. ↑ 2.0 2.1 Giles, Lionel The Art of War by Sun Tzu - Special Edition. Special Edition Books. 2007. p. 62. ↑ 3.0 3.1 Nicolas Werth, Karel Bartošek, Jean-Louis Panné, Jean-Louis Margolin, Andrzej Paczkowski, Stéphane Courtois, The Black Book of Communism: Crimes, Terror, Repression, Harvard University Press, 1999, hardcover, 858 pages, ISBN 0-674-07608-7, page 467. ↑ Sawyer, Ralph D. The Seven Military Classics of Ancient China. New York: Basic Books. 2007. pp. 149–150. ↑ 5.0 5.1 Sawyer, Ralph D. The Seven Military Classics of Ancient China. New York: Basic Books. 2007. p. 150. ↑ 6.0 6.1 Sawyer, Ralph D. The Seven Military Classics of Ancient China. New York: Basic Books. 2007. p. 422. ↑ 10.0 10.1 10.2 Sawyer, Ralph D. The Seven Military Classics of Ancient China. New York: Basic Books. 2007. p. 423. ↑ "Yinqueshan Han Bamboo Slips" (in Chinese). Shandong Provincial Museum. 24 April 2008. http://www.sdwenbo.com/art.asp?id=26&type=6. ↑ Jonathan Clements (21 June 2012). The Art of War: A New Translation. Constable & Robinson Ltd. pp. 77–78. ISBN 978-1-78033-131-7. ↑ Sawyer, Ralph D. The Seven Military Classics of Ancient China. New York: Basic Books. 2007. p. 421. ↑ Sawyer, Ralph D. The Seven Military Classics of Ancient China. New York: Basic Books. 2007. pp. 150–151. ↑ Ebrey, The Cambridge Illustrated History of China, 29 30. ↑ 18.0 18.1 Griffith, Samuel B. The Illustrated Art of War. 2005. Oxford University Press. p. 17, 141-143. ↑ McCready, Douglas. Learning from Sun Tzu, Military Review, May–June 2003. ↑ "Put crafty Belichick's patriot games down to the fine art of war". The Sydney Morning Herald. 2005-02-04. http://www.smh.com.au/news/Sport/Put-crafty-Belichicks-patriot-games-down-to-the-fine-art-of-war/2005/02/03/1107409980481.html. ↑ Winter, Henry (June 29, 2006). "Mind games reach new high as Scolari studies art of war". Irish Independent. http://www.independent.ie/sport/soccer/mind-games-reach-new-high-as-scolari-studies-art-of-war-95223.html. Wikimedia Commons has media related to Sunzi.